Michael Richardson scored his second half century of the match before Derbyshire spinners struck on the final day of the the Division Two game against Durham at Chesterfield. Richardson and Cameron Steel shared an opening stand of 91 in 38 overs to give Durham a solid stat in pursuit of 282 for victory but both were dismissed in the space of three overs. 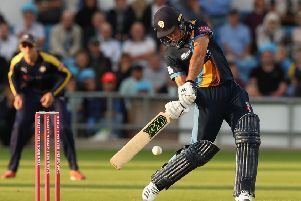 Steel was first to go, caught behind making room to cut 16-year-old off-spinner Hamidullah Qadri and Richardson followed for 62 when he edged Imran Tahir to slip. Graham Clark swung Qadri over midwicket for six as he and Jack Burnham added 50 to take Durham to 145 for 2 at the interval, 137 away from their target.